War! Huh! Yeah! What is it good for? Videogame titles, of course! Warframe, War Thunder, Men of War, Warface, our industry sure does love to take a seemingly random word and attach "War" to it somewhere. Yet none of these games hold a candle to the Creative Assembly's latest, which manages to drop the warbomb twice within the space of three words. If Warbomb isn't a game already, incidentally, then it should be. But can Total War: Warhammer live up to its splendidly ridiculous title? Just how much war will it contain? What will the war concentration be exactly? To find out, I chatted to Creative Assembly designer Rich Aldridge to ascertain the precise amount of war included in Total War: Warhammer. 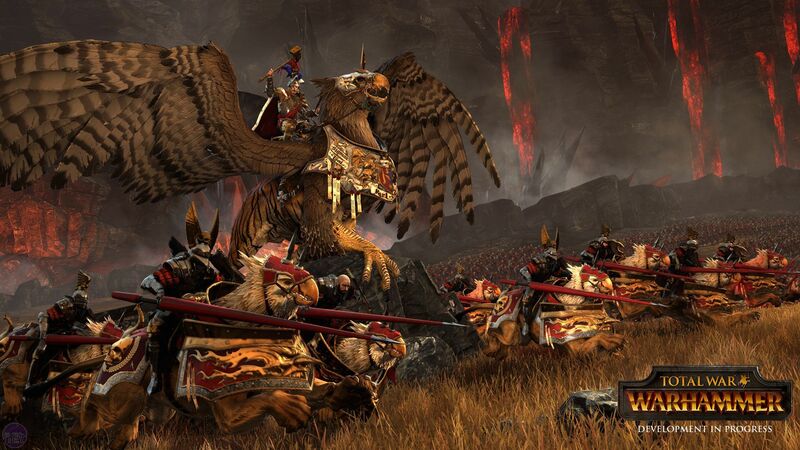 We also discuss flying units, Ragnarok Spiders, faction-specific campaign goals, and how moving away from historical settings has affected the studio's approach to RTS design. Warning, this interview may contain references to war. It's not that dissimilar from doing a project in the historical sense. We use the Army books from Games Workshop that they've created over a number of years. We were using the 8th edition, which was the last edition before they revamped and did their new content, as a start point. But obviously not all the races are up to scratch, so we've had to dig back as well. We hired a guy who's our lead writer, who used to work for Games Workshop for a number of years, so he's brought a lot of knowledge as well. GW sent down two of every miniature for us to play around with. So we fully embraced the idea of actually physically fighting the battles. As well as reading the books, we're playing the game and going "Ok, this race is good at this, or this unit is really good at that." And that's what helped us pick and choose which races we've gone for, which units we've gone for and which characters we've gone for really. There's so many to choose from. Obviously the other thing with Warhammer is it's turn-based. 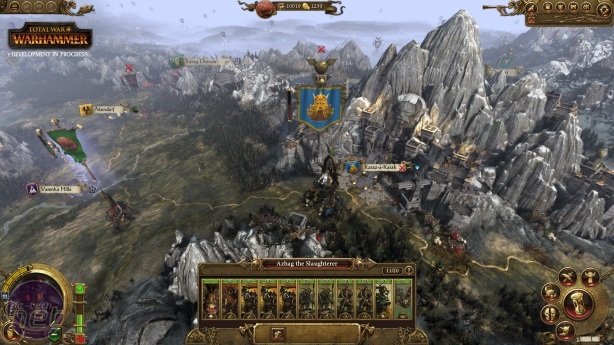 Total War is a real-time strategy. So how do you take those turn based units and implement them into an RTS? We've looked at where their statistics, their ideas are similar to our own. Some of them we've taken and used straight away where appropriate and other ones we've developed. So magic resistance, we've done some work there so that, so ethereal guys, they're not going to take normal melee damage, they're going to need magical weapons to strike against. Then we've also looked at features of a race or a unit which might work better as a campaign feature. 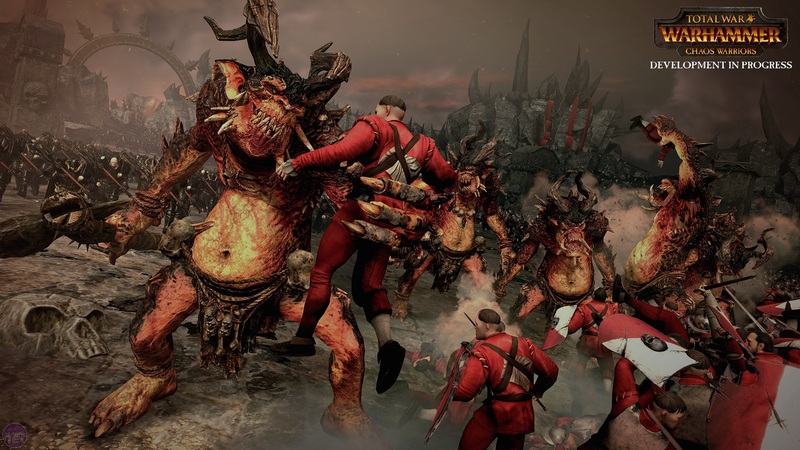 Because Warhammer is turn based and our campaign is turn based, some of them work better there. So one of the ones that we chose for that was animosity. That is a really good fit in the campaign game. As your armies are travelling around, they're not fighting, they're going to start suffering attrition, so you need to either fight someone or raid - the other thing for the goblins and Orks is they're pillaging settlements and somewhat stabilising their thirst for blood.